Sydney, May 4, 2017 (Global Fashion Wire) - An actor's process for creating a character is fascinating, unique to themselves and molded by personal experience. Good actors create a character that elicits an emotional response to a story. Great actors disappear completely into their character. We love them; we hate them, but more importantly they become real to us. When I sat down to chat with Tristan Mckinnon from the short film "Alfred J Hemlock" that will soon be making the festival circuit, I had an idea of who I was about to meet, but I could not have been more wrong and that doesn't bother me one bit. It was 8:00 pm on a Saturday night here in Texas, but the sun was shining brightly in Australia when our call connected on Skype. There sat Tristan McKinnon in a beautifully decorated sitting room. His brother and sister were in the background smiling and waving and he introduced me to them, explaining that his family had leased the residence together to spend some quality time. Now, I have to admit I was taken aback. McKinnon is quite simply, a charming young man with an easy, infectious laugh and leading man good looks. He is full of life and radiates an almost kinetic energy as he talks about his latest project. In short, he's everything his character was not and it was only then that I realized just how great this young actor was. 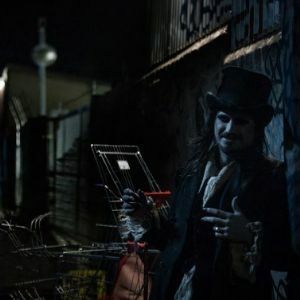 After a few minutes of chatting and getting to know one another a bit, we got down to the business of talking about his alter ego Alfred, and how he came to create this fiendish creature who feeds on the souls of the lost and lonely. It all started with a Facebook message. McKinnon saw that Edward Lyons was working on a different film and sent him a congratulatory message. A short while later, Lyons replied thanking him but also telling him that he had another film that he was working on and he thought McKinnon would be perfect for the lead. It wasn't long before the actor had a script and was diving deep to find out just who Alfred J. Hemlock was. The actor was immediately struck by the fact that there was an actual story to tell without a lot of extraneous action, and he was over the moon about it. "It was probably the first short film I've done where it was mainly a dialogue driven piece," he explained. "It was all set in an alleyway. It was two characters telling a story. Coming from a theater background and being a theater actor that was really great to me. And here's Hemlock and I get to really explore who he is and why and how he came to be this spirit or demon that he is." "Alfred J. Hemlock" does indeed take place in one alleyway late one night. Emily (Renaye Loryman) is abandoned by her boyfriend, Guy (Christian Charisou), after he accuses her of flirting with other men at a party. As broken hearted Emily makes her way down an alley, she meets the villainous Alfred J. Hemlock, a creature intent on taking young Emily's soul. Lyons gave Alfred completely over to McKinnon, allowing him to explore the fiend's personality, search for his voice, and ultimately bring him to devilish life. It wasn't until he was in costuming and make-up, however, that he realized what he had created. "I remember walking out and saying, 'I think I found the love child of Beetlejuice and Captain Jack Sparrow,'" McKinnon laughed. "I wasn't trying to go for that, but I think it just came out. I think my personality is a bit like Jack Sparrow to begin with and it kind of bled into the work. There were still elements to be added, however, and many of them fell into place through a run of bad luck. They were booked for a late night weekend shoot. Two days were needed to film the short and that first weekend, nature stepped in and rained them out. Not to be deterred, Lyons booked a second weekend. They had to bring in a different director of photography as the first had to be on a commercial shoot. Nature was on their side this time but due to a mechanical error, every single shot was underexposed and too dark to be used. It was now a matter of principle for Lyons and the cast and crew. A third weekend shoot was booked, the cast came in and a third DoP was brought in. Nature and mechanics complied this time and the entire shooting schedule went off without a single hitch. As frustrating as it all was, McKinnon points out that it allowed him even more time to develop a closer relationship to Alfred and the way he manifested. It also allowed Lyons to bring even more mania to the section of the film in which Alfred torments and tortures Emily in an attempt to break her. "There's this part of the film where I think Ed decided to go wild style. He threw in homages to Kubrick and Saw and it was all very spontaneous. It was kind of great this sort of montage of Emily's torment. He found this tricycle for me to ride and it worked so well with Hemlock's personality. And it's kind of out there, but it also points back to these films that we all know and love." McKinnon lamented the end of shooting and says he'd return to this character again if given the chance. "It's funny," he says, "but you almost want him to win, even though he's a really bad guy. It would be fantastic to reach into his history and find out more about him. Was he cursed? Is he a demon? Does he answer to someone else? In my mind, he might be a demon who fell when Satan had his battle with heaven. He's removed from it. And so he hungers for the light that he is barred from, and he hates that light as much as he hungers for it. So he seeks it out in the only way he can. He finds these people whose souls burn brightly and takes it from them. The problem is it's never enough. There's a lot to explore there." I'm with you on that, Tristan. And with luck, just maybe we'll see more of Alfred J. Hemlock in the future. For more information about the film and to keep up to date on festival appearances, you can follow them on Facebook, their Website, and on Twitter and Instagram at @AlfredJHemlock. Currently, it's slated to make its debut at the Academy Award qualifying Bermuda International Film Festival in May of 2017.